It didn’t take long for us to figure out our teeth were pretty tough. Besides having loose baby teeth, we discovered that we can chew pretty rigorously and bite down into most things and our teeth have stayed intact. There’s a reason Jawbreaker candies and salt-water taffy have stuck around for so long. Perhaps you were also told that your teeth are harder than steel, iron, and nickel, and that they can resist to 30,000 pounds of compressive force. Teeth are no joke! In fact, they are as impressive as the facts before, but are they as invincible as we think? How much can our teeth actually withstand between daily use, habits, or over a long period time? Instead of thinking of teeth like one compact structure, they’re actually more like a weaved-basket. When and if your teeth do eventually crack, this micro-weaved structure helps prevent cracks from spreading after an impact. Much of the rigor we put our teeth through is rather unsuspecting in nature. Do you regularly do in any of the following? Unfortunately, nail biting ruins more than your pretty manicure. This is one of the most common habits that people have, whether that’s due to stress, boredom, nervousness, or you just don’t want to grab the nail clippers sometimes. Your nails are one of the hardest surfaces on your body, so it’s should come as no surprise that chomping down regularly on your finger nails can actually cause damage. Nail biting can also result in a number of issues. It can cause cracks, chips or erosion of the front teeth, or even fracture the enamel on your front teeth from excessive chewing. Over time, it can cause your teeth enamel to wear down and increase sensitivity. In more severe cases, constant nail biting can cause TMJ. TMJ is a condition that causes pain, clicking, or popping in the jaw. Your parents or friends might fuss at you for this one out of sheer annoyance, but casually chewing on ice happens to the best of us! Crunching on ice is satisfying, hydrating, and really bad for your teeth and gums. Ice chewing will crack and chip your teeth, damage tooth enamel, and can cause problems with existing dental work like fillings and crowns. Chewing on ice definitely is not worth damaging your teeth. If you still want the satisfaction of a crunch, consider switching to baby carrots or apple bites. If ice chewing is a habit you can’t seem to break, then you may want to consider talking to your dentist. Ice cravings can actually be a sign of anemia, also known as an iron deficiency. Ever eaten caramel and tried brush your teeth afterwards? Chances are that you could still and taste the caramel stuck in your teeth. Sticky and chewy foods attach to and between your teeth for a prolonged period, resulting in bad bacteria feeding on that lingering sugar in your mouth, thus creating cavities. It’s very important not only to brush thoroughly after eating these types of foods, but also to floss and drink lots of water! Based on popular commercials, we’ve been told that chewing gum is recommended by 4 out of 5 dentists, so it’s great for the teeth and the digestion track, right? Wrong. To start, chewing gum is filled with artificial sweeteners when they are labeled as sugar free. The “safer” sweeteners aren’t any better for your teeth. Artificial sweeteners can do as much damage to the tooth enamel as normal sugar, and under the guise of being healthier, can influence the increased intake of artificial sugars over natural sugar. Excessive chewing causes wear and tear on the cartilage and surrounding joints in the mouth, causing or aggravating jaw-conditions like TMJ. Fun Fact: Chewing gum requires eight different facial muscles that put pressure on the nerves in head. This means that chewing gum can also cause intermittent headaches! If these aren’t enough reasons to hinder you from chewing gum, then we will dispel one final myth. Chewing gum can only give you the feeling of being “minty clean,” when in reality, bad breath is due to tooth decay and sometimes digestive problems. Switching up the foods in your diet can actually improve bad breath, not popping in gum after eating a stinky meal. Seeing your infant or toddler bite can be a cause of concern for parents; are they trying to relieve the pain from teething? Do they just want to experience the sensation of biting? Or is it rooted in frustration, anger, confusion, or hunger, using biting as a method to communicate difficult feelings? Children can bite for a number of reasons, and while it can be upsetting and potentially harmful behavior, it is usually a phase outgrown and a behavior redirected. Should parents be concerned about the effects of biting on their children’s teeth? Well, sure! It’s always important to pay close attention to the state and progression of your child’s teeth. Depending on what the child is biting, it may be detrimental for their teeth and jaw (i.e. if they’re biting extremely hard objects). Talking to your dentist is the best way to determine what biting behavior and habits are too excessive. Although babies lose their first set of teeth, baby teeth are important for eating talking, and smiling, as well as keeping spaces for the adult teeth to come in. Ensure that your children brush and floss at an appropriate age, and take them in for regular dentist visits to adjust them to oral health upkeep. Fun fact: did you know that bite-marks aren’t scientifically backed in forensic evidence anymore? There is no reliable methodology to support that human bite marks are unique. We’re don’t recommend using teeth as a murder-weapon or biting other humans in general, but if your toddler is ever erroneously convicted of murder on bite marks, remember this article. On the bright side, your dental records and teeth themselves can still identify you! Cracking into nuts, chewing un-popped kernels, opening beer bottles with your teeth, and gnawing on pen caps; these are all destructive, stress-inducing habits for your teeth. Just as carrots and apples can be great alternatives to bad hard foods, it’s worth adding that hard, raw foods are actually great for your teeth and gums. Think of it like a dog chewing on a bone to clean their teeth and gums; chewing raw foods does the same for us, removing plaque while also stimulating the jaw and teeth nerves. If we avoided all hard foods, it really wouldn’t be good for our teeth! Over time, what’s going to happen to my teeth from aggravated chewing and biting? Depending on what stage you’re in during your life or how your dental care has been, your teeth may have different needs. People with braces know not to bite into apples and to avoid tough meats and hard breads, and people with veneers know to avoid crunching into raw vegetables. Those with dentures have their own set of rules to abide by, just as those with crowns and fillings do too. The best way to know what can happen is to talk to your dentist! 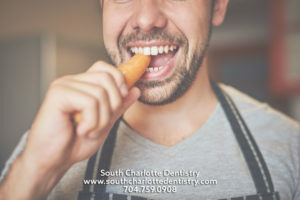 If you’re suffering from a chipped tooth, or know that you’re a chronic chewer or biter, South Charlotte Family & Cosmetic Dentistry is here to help! Make an appointment today to learn more about getting a filling, crown, implant, or to talk about managing habits putting your teeth at risk.